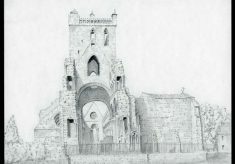 Original drawing by John Clark of Jedburgh Abbey in the borders of Scotland. The drawing shows the front elevation of the abbey ruins with a view through to the interior. A low wall with railings is in the foreground and a tower with an archway dominates the picture. Pencil drawing on cream drawing paper.